Product prices and availability are accurate as of 2019-04-21 06:47:58 UTC and are subject to change. Any price and availability information displayed on http://www.amazon.com/ at the time of purchase will apply to the purchase of this product. 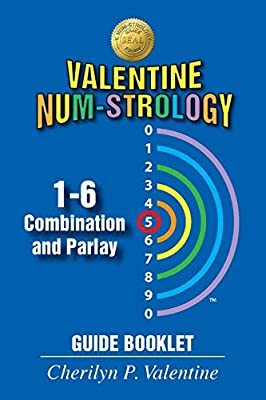 Author Bookstand is proud to offer Valentine Num-Strology: 1-6 Combination and Parlay Guide Booklet by Bookstand Publishing. Bookstand Publishing offers books by the best indie authors throughout North America and the world. Bookstand Publishing is dedicated to offering original content to a broad audience and promoting great authors, literacy, and freedom of expression. Valentine Num-Strology: 1-6 Combination and Parlay Guide Booklet has generated a lot of interest and excitement and we think it would be an excellent addition to your library. This booklet, the first in a series, was written for the pleasure and amusement of shut-ins and ongoing people who enjoy the game of combination of lucky numbers. A true source to play one’s lucky numbers by. 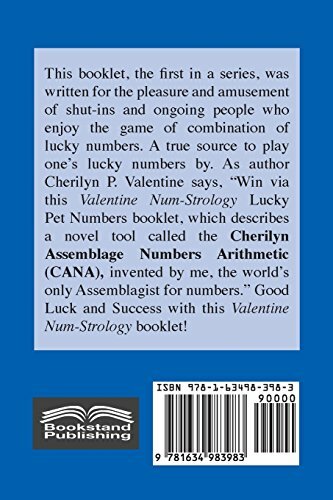 As author Cherilyn P. Valentine says, “Win via this Valentine Num-Strology Lucky Pet Numbers booklet, which describes a novel tool called the Cherilyn Assemblage Numbers Arithmetic (CANA), invented by me, the world’s only Assemblagist for numbers.” Good Luck and Success with this Valentine Num-Strology booklet!